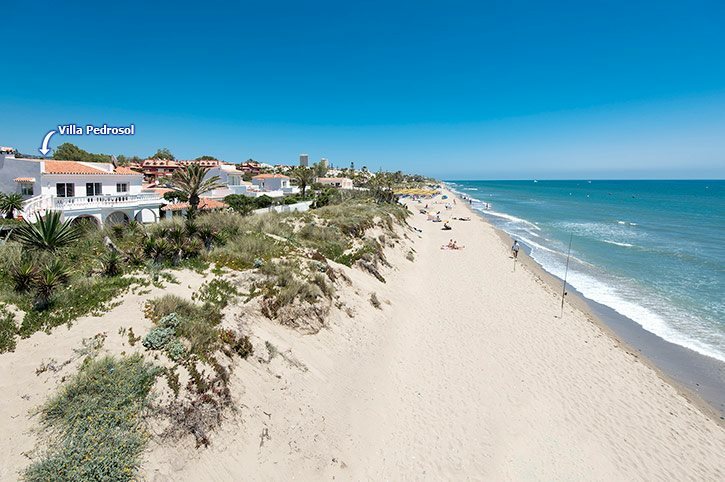 The location of Villa Pedrosol is simply great, it's positioned on Real Zaragoza Beach with splendid sea views. The private pool is surrounded by mature gardens with a gate opening directly onto the golden sands! A choice of restaurants are just a short walk away too, whilst the neighbouring resorts of Fuengirola and Marbella are both within 15 minutes' drive. Pool heating, air conditioning/heating in the bedrooms and lounge, and WiFi are included in this 4 bedroom villa. An ideal haven for beach lovers with direct access to the sands from the garden. Striking sea views too! The swimming pool is surrounded by sun loungers where you can relax with a cool drink, just a stone's throw from the beach. There is a BBQ house to one side with attractive tiled seating, a table and a built in BBQ - all you need for dining alfresco. A garden gate opens directly onto the rugged sand dunes, whilst there is also alternative beach access located a 50 yard walk along the road. The front of the property is enclosed, with access via both pedestrian and driveway gates. Access to the house is either via the front door or through the side gate to the rear garden. On the ground floor there is a comfortable, open plan lounge with a feature fireplace and a dining area. Patio doors open to a lovely, arched terrace overlooking the pool and garden. Upstairs, there is a larger lounge with fantastic views of the sea, a wood burning feature stove, seating and a flat screen TV. Patio doors open out to another terrace that runs along the back of the house making it a perfect spot for dining or relaxing with wonderful beach views. An external, sweeping staircase leads down to the pool and garden below. The country style kitchen is fully equipped for all your holiday needs. On the ground floor there is 1 dual aspect double bedroom with garden views and 1 twin bedroom. These bedrooms share a large en suite bathroom with a shower cubicle and corner bath. Upstairs there is 1 further dual aspect double bedroom with sea views and a separate shower room. To one side of the front door there is a separate annexe with a twin bedroom, fitted mirrored wardrobes and en suite shower room. This villa is registered and licenced by the Junta de Andalucia to comply with local legislation on holiday rentals. This number is: VFT/MA/07012. This villa is well positioned, facing the beach, with splendid sea views. It's located in the pleasant residential area of Las Chapas de Marbella, 5 miles east of Marbella. There are restaurants a short stroll away, with the supermarket within a few minutes' drive. The neighbouring resorts of Fuengirola and Marbella are both within 15 minutes' drive. Villa Pedrosol is ideal for families or groups. You've also got our Villas Amarillo on the same street or Golden Beach on the street behind should you be part of an even larger party. Aside from the local supermarket there are many street markets, and the regular market in Marbella is on a Monday. The cobbled streets of Marbella Old Town provide a charming shopping experience, whilst the popular mall at La Canada shopping centre is just 10 minutes' drive away. Alternatively, a little further afield, you will encounter all the designer goods your heart could desire in the famous Puerto Banus. There are some restaurants and beach bars a very short stroll away, or there is a good selection to be found at the Elviria centre which is 1 mile from Villa Pedrosol. For a greater variety, spend a day in the resorts of Marbella or Fuengirola with a whole host of restaurants. Alternatively, visit the nearby Marina at Cabopino, a small yet attractive port with a fabulous beach area and several cafes and restaurants. If you feel like venturing further away, Puerto Banus offers a great variety of places for dining, whilst enjoying this chic setting. On your door step, through the back gate, you have the rugged sand dunes, golden sands and the lovely shores of the local Real Zaragoza Beach. A bit further away is the famous area known as Nikki Beach, great for champagne parties and people watching. For a great day with the kids there is arguably nowhere better than Funny Beach, just at the entrance to Marbella town, with jet skis and go karting. The children and adults alike will enjoy a day at the water park, Parque Acuatico, located in Fuengirola. Or for the animal lovers, there is the Biopark Zoo, also in Fuengirola town. Take a look here at the Costa del Sol villas that are currently on sale. Villa Pedrosol is not available to book for season as it is sold out. Take a look here at the Costa del Sol villas that are currently on sale. Located at the El Rosario exit, km 188 of the N340 coast road, 5 miles east of Marbella, the El Casco Tennis Club offers all year round play on six clay and four hard courts with a weekly doubles tournament played on Sunday afternoons. Also Padel tennis courts, restaurant and bar. Tel 952 83 7651. Without doubt one of the most difficult on the Costa del Sol with a long and mountainous course and dangerously narrow freeways, making it an official competition course that has been imaginatively designed to complement the surrounding environment by Robert Trent Jones. It has no less than 9 holes surrounded by lakes, many rivers and abundant trees apart from several small greens with nasty curves. The 3rd hole needs a very direct drive avoid a large dip and bunkers right up to the green itself. On site too golf school, buggy and club hire, shop, bar and fine restaurant. Address: Crta, Cadiz Malaga km 188, 29600 Marbella. Tel: 95 283 05 00 Fax: 95 283 43 53 Website: www. marbellaclub.com For golf bookings - Email: info@marbellagolf.com Description: 18 holes, Par 72, 5864 meters Green Fees: 66.11 euros Location: Between Urbanizacion El Rosario and Hotel Los Monteros on the N340 coast road, 10 kms east of Marbella. One of the most popular water parks on the coast is the Mijas Aquapark where the Adventure River ride, a 300ft winding raft slide awaits you. Try surfing the wave pool or the huge kamikaze slide, bathe in the clear blue waters of the lake, or enjoy the twists and turns while speeding through the labyrinth slide to the pool at the bottom. For young children and tiny tots Aqualandia has two water playgrounds and a shallow activity pool. All this set in lush gardens with a variety of sports facilities, great restaurants, picnic and bbq areas. Villa Pedrosol was in a lovely beachfront location with lovely views from upstairs and the garden was well tended. Close to beach restaurants. Overall the villa was as we had expected and was in a wonderful position. Fabulous villa location and excellent customer service, very responsive and helpful staff both on phone and in resort. Overall we had a great holiday and loved the location and outside spaces, particularly the large balcony with wonderful views, the garden and pool. The customer service was excellent, as was value for money, so we would consider travelling with Villa Plus in future. I would readily re-book this villa, as it is very good. It was a well equipped villa, in a great position. My villa was more than I expected, I was very pleased with the whole holiday experience. Thank you. We had the most fantastic holiday, it was everything that we expected and more! Overall the villa was exactly what we were looking for in terms of space and location. Villa Pedrasol was excellent. It's location right on the beach was fantastic and at all times we had total privacy. The pool was spotless and the gardens were maintained beautifully. One night my son locked us in by leaving the main keys in the small included seperate villa and when I contacted the rep Maxine Purdy she was excellent. She came straight away (although at night) and brought a spare key. She was friendly efficient and nothing was a problem for her. She is an asset to your company and please pass my comments on to her manager with my thanks to her. A relaxing holiday, we are considering booking the same villa next year. Whenever I called Villa Plus everyone was extremely helpful. I thought the villa was exceptional, it was in a beautiful setting and we as a family could not have asked for more. The Villa Plus staff in spain were also helpful when we called their office a couple of times with small queries.So I would like to say a big thank you to everyone at Villa Plus for making our holiday stress free. I would definitely use your company again.Thank you.